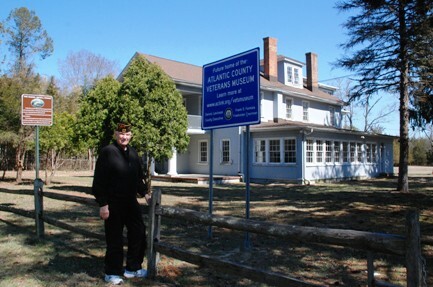 The Foundation was incorporated in 2014 as a not-for-profit organization to support the development and the operations of a museum to house, preserve and exhibit artifacts and materials attributed to the military service of Atlantic County citizens through all conflicts and branches of service. Financial support will enable the Museum to conserve and protect historic artifacts in its collection and prepare them for exhibition, as well as provide special educational programming. The Foundation seeks to provide financial support for the Museum through calls for individual donations and a variety of activities including fundraising events. Check our Event Calendar for more information. The Atlantic County Veterans Museum is expected to open in 2017. The museum will be housed in the historic manor house built by Daniel Estell c. 1832 which is owned by the County of Atlantic and is being renovated for adaptive re-use as a museum. The Foundation will enter into a lease agreement with the County for its use. The building is located not far from the Atlantic County Veterans Cemetery in the Atlantic County Park at Estell Manor on Route 50 South of Mays Landing. A committee of veterans and historians was established by Atlantic County Executive Dennis Levinson to assist with gathering, researching and accessioning artifacts and materials that will become part of the Museum’s collection. Welcome to the Atlantic County Veterans Museum Foundation website! The Atlantic County Veterans Museum will be open on Sunday, November 11, in observance of Veterans Day. For more information about the Foundation you can send queries by email using our Contact Form. Copyright © 2019, . Atlantic County Veterans Museum Foundation is a 501c(3) organization.